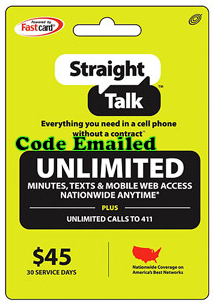 Straight Talk $45 Unlimited Talk/Text/Web 1 Month Prepaid Card- Code is emailed after purchase. This is required to set up a new straight talk account- and is also good for refilling yourÂ existingÂ account. No better price out there.